ENCOMPASSING STARS - 1 DAY CLASS DESCRIPTION For average skill level quilters. A one day class for quilters with an average skill levels. This class teaches design and construction of the traditional Mariner’s Compass star. This highly simplified version of the technique was developed to make drafting these stars FUN instead of technically stressful. 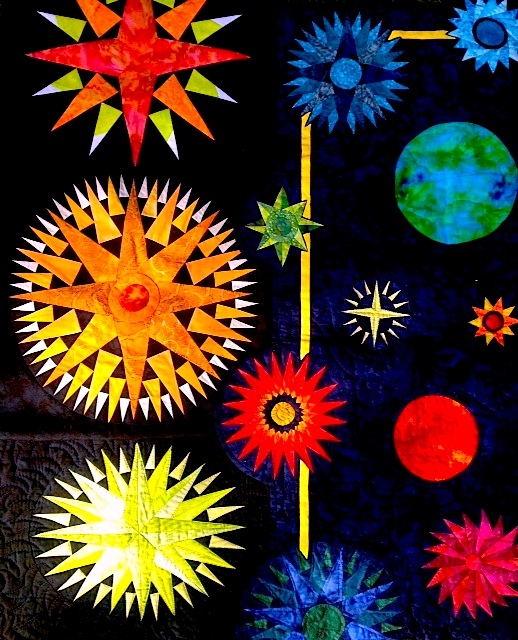 This class includes pattern and template making for circular stars with plain or split rays and optional ways of setting stars in background. Instructions are covered on paper, machine or hand piecing. Thorough notes are provided.